I got a letter from my insurance agent out of the blue last week. Now, I’ve been with this agency for over 15 years. In fact, I’ve been with them for all of my life, as my father used them too. So, I do trust them when they make recommendations like this. Basically, my agent was telling me my wife and I were under-insured. The need for increasing our coverage stemed from the fact that judgments for court awards have been getting larger and larger – and to keep up with how costly these can be – we needed to raise our liability coverages. Now, I’m always a skeptic when it comes to these things. I sometimes view them as the retail clerk trying to sell you a warranty on your boom box (which happened to me way back when when I was a youngen). I don’t generally like to insure for the 5% chance that something will go wrong – especially when that item could be paid for with two or three premium payments. I do regard insurance as a necessary evil. As the saying goes – you don’t need it, til you need it – and you’re thankful you have it when you do (or something to that affect). I’ve never thought the litigious nature of our society would start impacting us all. But – this could be the beginning of it. With everyone suing over this and that – we are all going to pay for it, one way or the other. In this case, it is through our increased premiums. My agent was also trying to sell me an umbrella policy. 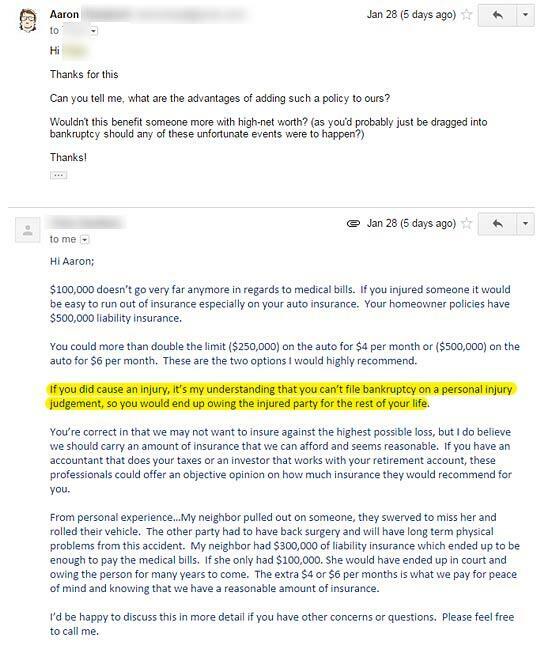 But to sell me that policy – the umbrella policy required that my coverage limits be raised on my current home and auto insurance. My current liability coverage is only $100k per individual / $300k per accident. Adding the umbrella policy would require that I bump those limits to $250k per individual / $500k per accident. Just to bump that coverage up (which my agent recommended) would cost me an additional $4/month. Not too bad for an extra piece of mind. In essence, if you cause a personal injury and your insurance doesn’t cover all the medical bills, etc – you could be on the hook for the rest. In Minnesota, this seems to be the case. Even if you file for bankruptcy. This is why many insurance providers are suggesting folks add an umbrella policy to their existing coverage. So, any amounts over and above that you may be held liable for – the umbrella coverage would kick in and pay the rest. Negligently hitting a pedestrian with your vehicle and causing serious injuries or damages beyond your current auto liability limits. Unknowingly serving food that causes guests to be hospitalized with food poisoning. Accidentally propelling an object from your lawn mower and striking someone, causing serious injury. Being involved in a serious automobile accident in another county. Accidentally hitting someone in the head with a golf club, baseball bat or ball. The umbrella policy pays for legal defense above the $1,000,000 limit. Of course, you’d have to check with your agent to see if these would be covered if you were to get a policy with them – but these are what would be covered under mine (guess the golf club incident could be something I may want to consider with the golf that I play). After all my inquiries and speaking with my agent more, I did decide to up my insurance policy to the $250k/$500k limits. But, have yet to decide on adding the umbrella policy. All total, adding the umbrella (in addition to the $4/month premium increase) could cost us an additional $300+ per year. I’m curious – have you added an umbrella policy to your insurance coverage? Or do you have any additional thoughts / experience with your insurance coverage? What to Do After You Paid Off Your Mortgage? 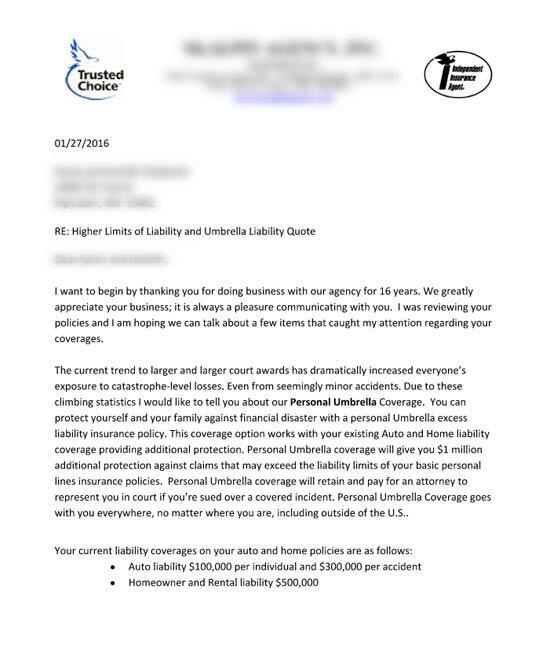 We added an umbrella policy a few years back, and it actually ended up providing us more coverage on both auto and home, and actually reduced our total cost versus what we’d been paying. Definitely something to look into if you have multiple policies with the same company. I have had a personal umbrella for many years, and I have slept well at night. I initially got it to give myself extra coverage for my exposure through rental house ownership, but I intend to keep it even after I sell the rental property. A very small cost for greater peace of mind! Thanks for sharing your experience w/ an umbrella policy Pops. Peace of mind is worth something! For that small of an upcharge, I’m definitely going to look into upping my coverage on our vehicles. Not sure my personal circumstance calls for umbrella insurance though. I know my wife’s uncle has an umbrella policy and definitely think it is important in his circumstance. He has several large parties per year (50-200 people coming through in a night) with alcohol, so the umbrella coverage would cover anyone who comes & goes from the party and remove any liability from him personally. Yeah, it isn’t much for what it could save you if something were to happen. Great wake up post Aaron. After reading this it had me thinking about the current college debt cycle and loan bubble from it. As the government continues to grant loans at higher amounts and to more youth, the colleges will continue to raise their tuitions to take advantage of the loans allowed to be issued. As supposedly more people sue for more money, the insurance companies are going to increase premiums or push more of these policies. Kind of a scary and manipulative cycle appearing here similar to the student loans? Especially if those pushing a victim to sue for greater amounts are in any way affiliated with insurance companies. Maybe I’m being a worry wort but smells fishy with one interest scratching the back of another’s at our expense. Great parallel example Aaron of how the colleges/universities are playing off the student loan fiasco. Hadn’t thought of that.